Founded in 2013, Liberty Montessori: The Place for Learning provides exceptional care for children six weeks to six years old in Jersey City, New Jersey. We offer developmentally appropriate learning opportunities in each of our classrooms along with extended hours and both full and half-day schedules. We invite you to explore the information on this page and then schedule an interview to experience the Montessori difference for yourself. The idea for Montessori education came from the work of Dr. Maria Montessori who discovered that experiential learning led children to a deeper understanding of academic concepts. Montessori is based on the belief that age-appropriate, self-directed activities; hands-on learning; and collaborative play instills a love of learning within children and prepare them for life success. 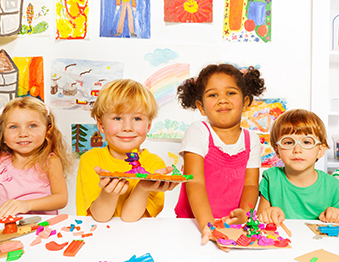 In Montessori classrooms, children learn by doing. Preschool and kindergarten tuition includes a special weekly STE@M workshop that complements and extends our regular curriculum.